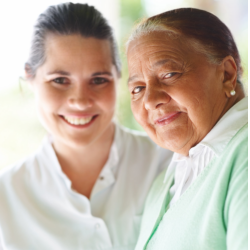 At Care Right There Home Healthcare, we PRIDE ourselves on our ability to not only match our clients to the right caregiver we also feel it is important to ensure the caregiver feels they also compliment that client. When relationships form bonds between caregiver and client, the probability of customer satisfaction and client/caregiver retention increases. That is critical to the foundation of the Care Right There business model. Our nurses and aides at Care Right There LLC act as caregiver and friend when family members or loved ones cannot be present. This enables family and friends to have peace of mind knowing that their loved ones are getting the attention they deserve, the companionship they desire, and the care they need. This allows your loved ones to remain safe at home or comfortable and secure at any facility when you cannot be with them. Our Caregivers visit our clients in their homes as often as necessary. Whether it’s a short visit or 24 hours a day, our staff provides the emotional support, caregiver assistance, light housekeeping and companionship to help seniors, elderly, the disabled as well as mentally and physically challenged adults function independently in their own home environments. Our nursing and professional aides are available for you or your loved ones as long as necessary, 24-hours a day, 7 days a week. Should the need arise, our nurses and aides are also available to provide care in a hospital or other facility. Upon request or as deemed necessary by the physician, Care Right There LLC can also provide skilled nursing services. Contact us today for more info about our services – 856-244-7722.